Loleta Community Garden is flourishing and invites the community to celebrate at two upcoming events. This Saturday September 12th the garden is having a Grand Opening from 10 a.m. to 12 p.m. The following Wednesday September 16th the garden is hosting an Open House and Gardener "Meet & Greet" on Wednesday September 16 from 3:30 - 4:30 p.m. before the monthly meeting of a network of community gardeners from 4:30 - 5:30 p.m. The garden is located at 700 Loleta Drive, at Loleta Elementary School and Community Resource Center. At both events you can tour the garden (kids will be leading tours on the 12th! ), enjoy light refreshments, see the pumpkin patch the students planted, get free resources for your garden, and learn about how to get involved with community gardens including the Loleta Community Garden, which welcomes more gardeners. For more information please contact the Resource Center at (707 733-5239, or visit www.northcoastgardens.org. Mid Klamath Watershed Council, based in Orleans, is fundraising for local school gardens at their Harvest Festival on Thursday September 17 from 5 - 9 p.m. at the Panamnik Building on Highway 96 in Orleans. Each dollar donated receives a raffle ticket, and the prizes are local beef or wine. Vendors are welcome to set up for the market at 5 p.m. and a dinner held at 6 p.m. asks for a sliding scale donation. Bring two pints of your best salsa for the salsa competition. There will also be a Kids corner, open mic, and music. For more information visit www.localfoodmonth.org. If you are looking for space to garden, there are still community gardens welcoming more participants. Contact information for many local gardens is available on the Local Garden page of northcoastgardens.org, or please call (707) 269-2071. September is Hunger Action Month, a time to raise awareness about the prevalence of hunger in our communities, and learn ways each of us can make a difference. The Humboldt County Community Food Assessment reports more than 31% of Humboldt County adults experience food insecurity, which jumps to more than 37% in households with children, and most live on fixed incomes or survive paycheck to paycheck. Food for People, Humboldt County’s food bank, has again prepared a calendar - “30 ways in 40 days” – filled with activities you and your family can do to help reduce hunger locally. Visit www.foodforpeople.org to view the calendar and learn more ways you can help end hunger in our community. September is also Humboldt County’s Local Food Month! Local foods are fresh, taste delicious, benefit local producers and the local economy, and reduce our community’s dependency on fossil fuels for transporting food. Community gardens are one avenue for accessing more locally-grown produce – as they provide land and resources for people to grow food - and so are Farmer’s Markets, farm stands, and buying locally- grown and produced items at many local grocery stores. Celebrate the benefits of eating local foods this month with local events such as garden and farm tours (see Loleta Community Garden, above! ), movies, dinners, crop mobs, galas, classes and much more! Visit www.localfoodmonth.org for more information. You can also submit your own local food event for posting on the website. The Northcoast Intercultural Skill Share Gathering is happening at Redwood Acres Fairgrounds Friday October 23rd through Sunday October 25th. Mark your calendars now, as this is an event you don't want to miss! The Gathering will bring together community members to share and celebrate what organizers call "traditional and modern" living skills - such as growing edible native plants, canning, composting, fermenting, grey-water systems, how to make a traditional fishing net, beekeeping, soil analysis, traditional Yurok storytelling, carving a redwood canoe, and much more! If you have a skill to share you are invited to submit it at NorthCoastSkillShare.org. On the website you can also sign up to volunteer - volunteers are needed for a variety of tasks. We hope you can join us at the Gathering to learn skills, share ideas, build community, and self-sufficiency! Gardening Gazette is a free publication of North Coast Community Garden Collaborative, a support network of and for local community gardeners, who work together to increase access to healthy lifestyle choices, particularly access to fresh, locally grown, and culturally appropriate foods. More information may be found at www.northcoastgardens.org or "North Coast Community Garden Collaborative" on Facebook. Students at Loleta Elementary School tend beds at the Loleta Community Garden. - Kale Yeah Party and Potluck: Friday September 11 from 4 - 7 p.m. at Humboldt State University's Campus Center for Appropriate Technology (CCAT). Come early from 12 - 4 p.m. for a volunteer workday. More information is available at www.localfoodmonth.org. - Loleta Garden Grand Opening: Saturday September 12 from 10 a.m. to 12 p.m. at the Loleta Community Garden (700 Loleta Drive, at the school and resource center). Kids will be leading tours of the garden including pumpkin patch the planted last year. Enjoy light refreshments, get free resources for your garden like plant starts and planting charts, and learn how to get involved with or support the Loleta Community Garden. For more information call the Resource Center at (707) 733-5239. - Native Plant Sale: Saturday September 12 from 10 a.m. to 3 p.m. at 2182 Old Arcata Road in Bayside, at the Jacoby Creek Land Trust. Native plants grow well and tend to be more drought tolerant. Many produce food. The event supports the California Native Plant Society. Learn more at www.localfoodmonth.org. -Free Health Fair: Saturday, September 12 from 10 a.m. to 2 p.m. at the Cher-Ae Heights Casino Events Center, 27 Scenic Drive in Trinidad. Meet with several community partners for health information and demonstrations at this free event. For more information contact Melinda Langlois at 707-825-2722. - Urban Berry Farm Tour: Sunday September 13 from 1 - 4 p.m. at Fresh Roots Humboldt in Eureka. Learn about urban farms in rural cities, tour an urban berry farm including backyard chickens and rainwater harvesting, and meet other backyard and community gardeners and farmers. Space is limited so reserve your spot today - to RSVP please call Michael or Caterina at (707) 502-2673 or email info@freshrootshumboldt.org. Proceeds benefit North Coast Community Garden Collaborative, and a non-perishable food drive benefits Food for People Food Bank. For more information visit www.localfoodmonth.org. - Garden "Open House" and Gardener Meet & Greet: Wednesday September 16 from 3:30 - 4:30 p.m. at Loleta Community Garden, 700 Loleta Drive (at the school and resource center). More information is available in opposite column, and at www.northcoastgardens.org. - Film presentation- FRESH the Movie: Thursday, September 17 at 7 p.m. at the Arcata Lounge Theatre, 1036 G Street in Arcata. Locally Delicious presents a great film and discussion about how we can engage in the emerging local fresh food system in Humboldt County and impact equity, the economy and our environment. For more information call (707) 407-0047 or email info@locally-delicious.org. - Harvest Festival and Garden Fundraiser: Thursday September 17 from 5 - 9 p.m. at the Panamnik Building in downtown Orleans. Support local school gardens at this fun-filled event. 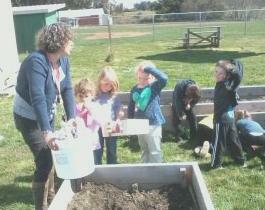 More details are available under "School Garden Fundraiser" in the opposite column, or at www.localfoodmonth.org. - Hands-on Canning Workshop: Saturday, September 19 from 10 a.m. to 4 p.m. at the Agriculture Center, 5630 South Broadway, Eureka. Join the U.C. Master Food Preserver Volunteers and Deborah Giraud from U.C. Cooperative Extension for a canning workshop at the Agriculture Center in Eureka. Both water bath and pressure canning will be covered during the preparation of three recipes. Register in advance, $30. Bring wide mouth pint and half pint canning jars with new lids, 6 of each. Bring a lunch. For more information and to register visit http://ucanr.edu/canningworkshop919 or call (707) 445-7351. - Talk about Food Distribution in Humboldt County: Wednesday September 23 from 5:30 - 7 p.m. at Humboldt Area Foundation, 363 Indianola Road in Bayside. Join the Humboldt Food Policy Council for an educational evening. Erin Derden-Little from Community Alliance with Family Farmers (CAFF) will present key findings from their study on Supply, Demand, and Potential Models for Distribution. Edie Jessup will share her experience working with distribution in the Fresno area. Free event! All community members are welcome. - Free Cooking Class: Cooking with Commodities and Seasonal Foods: Wednesday, September 24 from Noon to 1 p.m. at the North Coast Co-op in Eureka. Participants will learn how to prepare several delicious, healthy, low-cost meals. For more information contact Food For People at cculps@foodforpeople.org or (707)445-3166. - Fortuna Apple Harvest Festival: Saturday, October 3 through Sunday, October 4 from 10 a.m. to 4 p.m. on Main street in Fortuna. The festival is a city-wide celebration of history, family and farms, with plenty of apple and cider tasting as well as other tasty foods and includes vendors, a BBQ and live music. For more information visit fortunadowntown.com. - 6th Annual Youth Salsa Recipe Competition: Saturday, October 10 at Noon during the farmers market on the plaza in Arcata. Youth from after school programs partner with local chefs to create flavorful salsas. The event is part of the Humboldt County Office of Education’s nutrition education program through the North Coast Youth Culinary AllStars program. For more information please visit www.localfoodmonth.org.